Have you heard about the FoxFire Illuminating Technology yet? Well, you need to. Their products possess the amazing photoluminescence quality which will illuminate its surroundings for 1 full hour, and will continue to emit light for 17 hours when fully charged. And how do their products "charge" you ask? By sunlight, artificial light, or any low light. We're talking a no-batteries-required technology, that charges for free. In production photoluminescence crystals are added, which possess the unique ability to absorb and store the energy from light, which makes it act as a naturally occurring battery. This is a life-saving invention, making firefighters visible in even the thickest of smokes. So, what are some ways you can work this amazing safety-technology into your station? The Foxfire Illuminating helmet band is one, powerful yet-simple way to incorporate this technology into your life as a firefighter. It's made from an industrial grade, high temperature resistant silicone, and would be the perfect addition to your gear. One product testimonial really sums it up perfectly: "We used the Foxfire helmet bands in a recent search and rescue training session. There was so much smoke you couldn't see your hand in front of your face. Yet we could clearly tell where our fighters wearing the helmet bands were. It was amazing." The FoxFire All-in-One Coating Kit is the way to kill two (or three, four, five or more) birds with one stone when it comes to increasing visibility with your tools in the smokiest and darkest of places. This all-in-one kit by FoxFire comes with everything you need to coat your tools in this special two part, illuminating epoxy coating. Anything you paint using FoxFire's special technology (hydrants, couplings, spanners, helmets, chocks, doors, lockers, etc) will emit light in its surroundings for up to 17 hours with a full charge. It charges easily from any type of light source-but, the brighter the light, the longer the charge will last. With this technology there are no batteries necessary, and the rewards are great. Never be disoriented in a dark scene again! 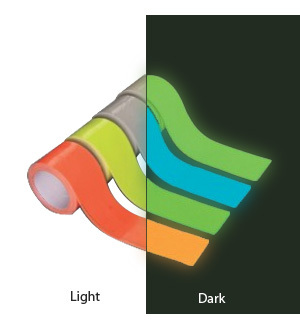 Lastly, the Illuminating Grip-Wrap is another easy way to get the great advantages of this technology. The wrap comes in four colors, giving you the opportunity to color code tools, yet still provides the same great benefits and technology that their other products do. Since the wrap colors are bright, they provide a day-glow and then also illuminate at night to improve visibility and give positional orientation when amidst a dark and smoky atmosphere. There is no doubt that the technology that FoxFire Illumination has created is amazing, and a way to increase safety amongst those of us in the industry. If you're attending the Firehouse Expo this weekend in Baltimore, MD, be sure to stop by our booth (#844) as FoxFire will be exhibiting and displaying just how unique and incredible their technology is! For more information, detailed specs and product information, click here. Great exhibit setup at the Firehouse Expo in Baltimore! Having Zach and Adam from FoxFire on hand to demonstrate the versatility of the photoluminescent helmet band, wraps and epoxy/resin kits in their "dark room" was key. I believe there are are many applications for this technology across the fire service.